Many of our customers have questions about the Cascading Balanced Scorecard. What is a cascade? Why do you need one? What can we do with it? We have answered these questions in detail in our eTraining, “The Cascading Balanced Scorecard”. 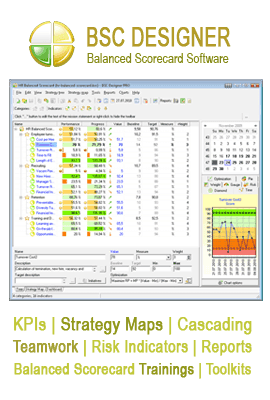 In this bonus mini-lesson, we will focus on a few key ideas about cascades. You can group some of your indicators together into sub-categories. Eventually, you will face the problem of having too many sub-categories. Or, you can create a new, lower-level scorecard. Instead of having one scorecard for your whole company, you can have a scorecard for each business unit. People from different business units will each work with their own Balanced Scorecard. Of course, your goal is to bring together the knowledge and performance information from throughout your company. So if each business unit develops their own scorecard, you need to link those scorecards together in a cascade. This way, you will have one top-level scorecard, which is linked to more detailed scorecards for each department. With a Cascading Balanced Scorecard, you can share your scorecard and involve more people in the process of designing scorecards and controlling indicators. Employees on all levels of your organization can work together to help the whole company succeed.